Imaging of eyes implanted with the telescope presents challenges. For patients with end-stage age-related macular degeneration (AMD), the Implantable Miniature Telescope (IMT; VisionCare Ophthalmic Technologies) enlarges images in the field of view and projects them onto healthy perimacular retina, thus reducing the effect of a blind spot in the patient’s eye. The IMT magnifies images by 2.2X to 2.7X, making it possible to see images otherwise unrecognizable due to the central scotoma.1 Although the IMT is indicated only for eyes diagnosed with atrophic AMD, a small percentage of eyes develop neovascular AMD following implantation.2 Ophthalmoscopy through the IMT is difficult because of the severely minimized view. Optical coherence tomography (OCT) is useful for monitoring the AMD status in these patients, just as it is in all patients with AMD. Figure 1. Fundus overlay view of the macula through the Implantable Miniature Telescope (IMT). This example depicts the difficulty of viewing the macula through an IMT. 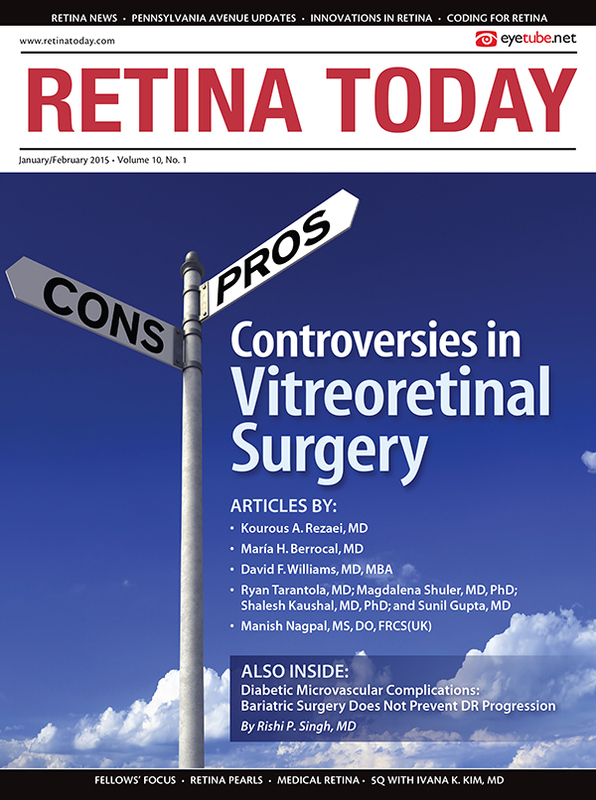 The IMT presents several unique challenges to the technician when performing diagnostic OCT imaging of the retina. The first limitation is due to the IMT itself; it is difficult, if not impossible, to get a clear view of the macula through the IMT. Figure 1 shows the fundus overlay view displayed to the imager through the IMT, although the overlay (colored mapping) is not visible during the scan. Patients with the IMT may be unable to focus on the fixation target during an OCT session due to the loss of central vision, resulting in constant scanning or moving of the eye. These obstacles may lead to longer OCT image capture times for patients with the IMT. Good dilation, ocular surface lubrication, and a reliance on landmarks (such as the optic nerve) to locate the fovea are some tactics imagers may employ to capture high-quality images. OCT imaging can be used to monitor AMD progression and the effects of treatment in patients with an IMT.2 Despite the challenges presented when capturing quality images of the retina in eyes with the IMT, 2 types of scans with the Cirrus HD-OCT platform (Carl Zeiss Meditec) can be used: Mac Cube 512 x 128 and HD 5 Line Raster. Figure 2. Cirrus OCT image of a retina through an IMT using the Mac Cube 512 x 128 scan. Figure 3. Cirrus OCT image of retina using a 3 mm HD 5 Line Raster to provide a quick high-resolution image of the fovea through an IMT. Figure 4. OCT image using a 6 mm Cirrus HD 5 Line Raster displaying subretinal fluid just temporal to the fovea. The 6-mm scan provides a view farther from the fovea than the 3-mm scan. The primary advantage of the Mac Cube scan is the ability to scroll through an entire macular image on a large full-screen display, thereby decreasing the likelihood of missing a small pocket of subretinal fluid (especially if it is located noncentrally). Another advantage is that accurate macular thickness measurements can be obtained by aligning the crosshairs directly on the fovea and selecting the “Set ETDRS center to slice navigator position” button.3 The Mac Cube can also be viewed 3-dimensionally by utilizing the 3-D analysis protocol. Figure 2 is an image of a Cirrus HD-OCT scan of an eye with the IMT using the Mac Cube 512 x 128 option. Figure 5. Cirrus OCT image of a retina with macular edema using a 6 mm HD 5 Line Raster (A). Cirrus Mac Cube image of the same eye (B). The HD 5 Line Raster provides much higher resolution than the Mac Cube. The HD 5 Line Raster offers the ability to obtain high-resolution images quickly, thus minimizing the effects of eye movement. More foveal detail can be acquired with this scan by decreasing the line spacing to 0.125 mm and shortening the scan length to 3 mm. (Note: A 6-mm line scan also works well if a view farther out from the fovea is desired). Figure 3 is an image of a 3 mm Cirrus HD-OCT scan of an eye with the IMT using the HD 5 Line Raster option, which provides sharper foveal detail. Figure 4 is a 6 mm 5 Line Raster scan showing subretinal fluid. Figure 5A is a 6 mm HD 5 Line Raster scan showing macular edema, and Figure 5B is a Mac Cube scan of the same eye as in Figure 5A. Note the difference in resolution between the Mac Cube and the HD 5 Line Raster. One disadvantage of the HD 5 Line Raster is that the imager has a chance of missing a small area of extrafoveal fluid. Martha Schlimgen is an imager/technician with Colorado Retina Associates in Denver, Colorado. Ms. Schlimgen may be reached at mschlimgen@retinacolorado.com. Melanie J. Fortin, BS, COA, is an ophthalmic technician at Colorado Retina Associates. Ms. Fortin may be reached at mfortin.email@gmail.com. Brian C. Joondeph, MD, MPS, is a partner at Colorado Retina Associates and a clinical professor of ophthalmology at Rocky Vista University College of Osteopathic Medicine in Parker, Colorado. Dr. Joondeph may be followed at @retinaldoctor and reached at bjoondeph@retinacolorado.com. 1. Implantable Miniature Telescope Professional Labeling. Vision Care Ophthalmic Technologies, Inc. http://www.centrasight.com/pdf/RM00603-02_Rev2_Professional_Use_Labeling.pdf. Accessed December 15, 2014. 2. Joondeph BC. Anti-vascular endothelial growth factor injection technique for recurrent exudative macular degeneration in a telescope-implanted eye. Retinal Cases and Brief Reports. 2014;0:1-3. 3. Cirrus HD-OCT (Models 400, 4000) [User Manual]. Dublin, CA: Carl Zeiss Meditec; 2009, Chapter 4.